Authentic Italian Recipe: Sausage and Broccoli Rabe Frittata - Found in Italy! The frittata will be easier to remove from the skillet if it sits for a few minutes—the top will deflate, and the edges will pull away from the pan. Preheat broiler. Whisk eggs and milk in a medium bowl. Mix in ½ cup cheddar; season with salt and pepper and set aside. Heat oil in a large skillet, preferably cast-iron, over medium heat. Add onion and chorizo and cook, stirring occasionally, until onion is softened and chorizo is brown, 6–8 minutes. Add broccoli rabe; season with salt and pepper and cook, stirring occasionally, until tender, 8–10 minutes longer. Reduce heat to low and pour reserved egg mixture over vegetables. Cook, shaking pan occasionally, until edges are just set, 10–12 minutes. Top frittata with remaining ¼ cup cheddar; broil until top is golden brown and center is set, about 4 minutes longer. Cut frittata into wedges and serve warm or room temperature. 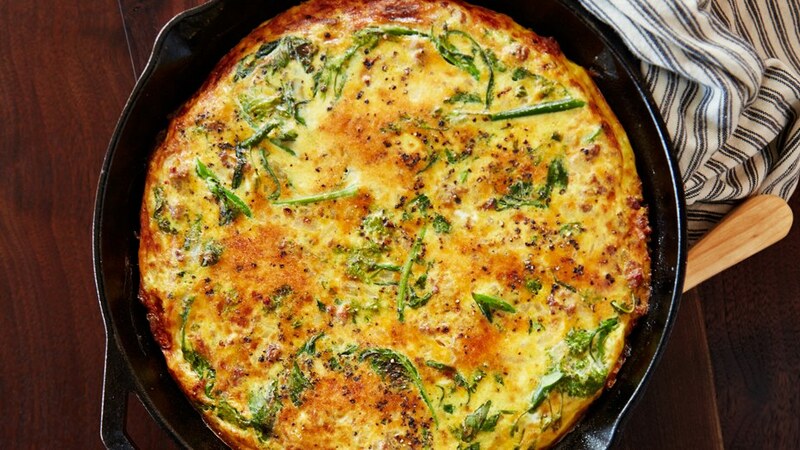 DO AHEAD: Frittata can be made 2 hours ahead. Let cool, then cover.